By Kellogg Switchboard And Supply Company. The microphone comes with a rubber neckpiece and integral wiring loom with PL-291 2-pin jackplug. Also fitted with an elastic neckband (M-199) and comes with the1942 dated 4-sided illustrated instruction leaflet. The throatmicrophone is in excellent condition with storage wear only although the strap lacks elasticity. Many AAF oxygen masks were worn without an integral microphone and these throatmicrophones were used instead. 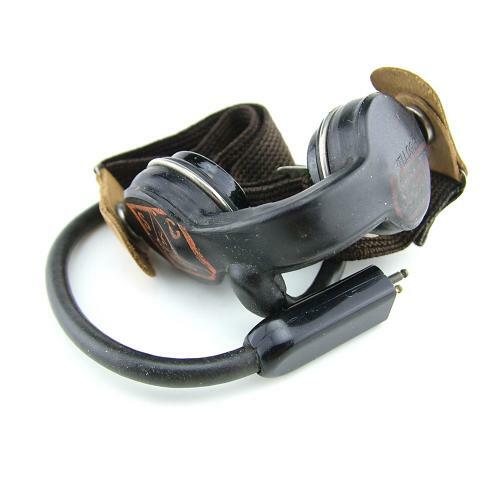 They were also used by aircrews wearing headsets, often over 'crusher' caps. Stock code H21244.